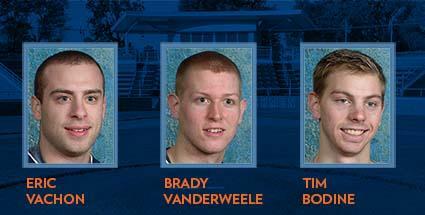 Three Hope College baseball players have been given All-Michigan Intercollegiate Athletic Association recognition for the 2014 season by the league’s coaches, including two All-MIAA First Team selections. Senior catcher Eric Vachon of Sterling Heights, Michigan (Warren De La Salle HS), and sophomore second baseman Brady VanderWeele of Kalamazoo, Michigan (Parchment HS), both made the All-MIAA First Team. Senior outfielder Tim Bodine of Gurnee, Illinois (Warren Township HS), received All-MIAA Second Team plaudits. Both of the All-MIAA First and Second Teams had 12 players selected. VanderWeele claimed his second All-MIAA First Team laurels after hitting .338 in league play (26-of-77) with 26 runs scored. He recorded a .976 fielding percentage with 65 assists and 56 putouts. Bodine batted .356 in MIAA play (36-of-101) with a team-best 36 runs scored. Fritz said Vachon had an unbelievable senior season. VanderWeele remained a force for the Flying Dutchmen, Fritz said. Bodine was outstanding in a MIAA season where numerous outfielders excelled, Fritz said. Graduating Hope College senior Alex Mouw of Holland is one of only 10 young scholars nationwide to receive an award through the Lilly Graduate Fellows Program for graduate studies beginning this fall.